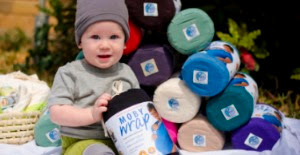 $50 Gift Certificate Moby Wrap Giveaway!!!!! Somebody gave me a Moby Wrap with my fourth child and I have to say that it was WONDERFUL! They had always intimidated me before but it was actually really easy to use and so comfortable for me and the baby. So I am so excited to be doing a giveaway with Intuitive Mothering of a $50 gift certificate towards anything on the Moby site! (She has lots of other awesome things on her site- from a blog to childbirth classes and massage therapy in the DFW area.) There are lots of really beautiful wraps on there! You will love how comfortable and beautiful they are. 1) Go LIKE Intuitive Mothering on Facebook. 2) Comment here on this blog post (below) and LEAVE YOUR E-MAIL ADDRESS. I can't choose you if you don't leave it. Please limit yourself to one comment. 3) Wait until Saturday evening when the contest closes. Then- CHECK YOUR E-MAIL!!!! Seriously people don't always e-mail me back when they win. Is that just strange or what? I will wait 2 days from the close of the contest then I will pick another person if I don't hear from you. I choose the winner randomly using random.org. Thanks for reading! I am so glad I get to give you awesome ladies a gift every now and again. Restrictions- shipping in the US only. yay! I am due in August! What a great giveaway! I have a little guy who loves to be carried and a toddler girl who is full of energy...wraps and carriers are awesome contraptions!! What a great giveaway! I really want a Moby for baby #3 due in July! YAY! This might be THE most fantastic giveaway I could imagine!! This is awesome. I have been checking them out lately but still not sure if I want to spend that kind of money Im not sure if I can put on myself especially with a toddler hanging off my leg lol. Were due in July with another little girl and was just going to use my old sling I had with our 3yo. What an awesome giveaway!!! amber.abston@gmail.com I would love to get a moby wrap! I'm due with my first (girl) in 2-4 weeks, and the Moby is on my must-have list! I enjoy all of your articles. Thanks for the awareness you bring to moms and moms -to-be! I would love to win so I could give a Moby to my SIL!!! She is pregnant with her second, and had a terrible crotch-dangler with her first. I'd like to provide the new baby with a better carrier!!! I am so excited! My 3rd will be born around Sept. I have been dying for one of these! Oooh! I popped over here to post an article I was interested in your opinion in, but I'll enter for a gift certificate! I just LOVE your blog and feel like we are kindred spirits! The things you say and do make me laugh and go, "Yeah, that's me too sister!" At the end of the article make sure to click the link for the "Minute by minute" of one of these operations. I got just as weepy as I do reading the natural birth stories you post here on your blog. Cooool! heers04 at msn dot com! Yay! I was going to buy one soon, they are wonderful! Love my black Moby, but would like a light colored one for summer! Just started learning about baby wearing and natural parenting! Of course it's with my 4th and last child. But it's okay cuz I'm going to wear this baby EVERYWHERE!! We're expecting our first in July, a Moby Wrap would surely help keep my hands free while I'm walking 3 dogs! Just had baby #3 almost 5 weeks ago, so this giveaway would be awesome to win! Baby #2 due in October, I could really use on of these! I'm due in two weeks! Pick me pick me!! i have a homemade wrap that I absolutely love, but I need a backup and would love to try a real Moby Wrap! I'm due with a little one in December and I would love to win this! Thanks so much! I love these. I think we need to get several to match my outfits..
Yay for this giveaway! I'm due in September with my first (it's a girl!) and I can't wait to wear her in the Moby Wrap!!! I would love to try a moby for my next baby. I used slings for both my babies! Idont have the slings any more and totally need a new one!!! Yay! Thank you for having such great give aways! So excited about your giveaway! I'm due in Sept and really can't afford a moby but could really use one. I am due in in December and would love a Moby! Baby is coming in June - this would be awesome! Excited about the giveaway and I've heard great things about Moby. I'm so excited for this giveaway! I'm due July 9th with our first baby. I would love to win a Moby wrap to use with our little girl! Love love love all things momabirth! COOL!!! I just liked your Facebook page - a friend introduced me to your blog via this giveaway!!! My baby is coming in June and I covet having a moby wrap to snuggle him/her in!!! Would love to win a moby! would love to win this for my baby girl due in 10 days. I'm always looking to add to my carrier collection! I've never tried a Moby (though I love my Sleepy Wrap/Boba) and hope I get the chance!! I had a homemade wrap with my last baby, it was made of broad clothe. I'd love to try a Moby! Growing #3 and I know I will be wearing this one even more than the last two! Hopefully it is with this Moby giveaway! Thanks! Woohoo! I'm pregnant with my first, and have had my eye on one of these wraps for ages! I love my Moby. I have several friends that are having babies soon and I would love to give them one to start their baby wearing journey. I love baby wearing my two year old and my 4 month old! Unrelated to the giveaway, I genuinely appreciate your blog. I read it faithfully, and appreciate what you have to say. I want a moby wrap so badly :) I am preg with my 3rd from a new wonderful marriage. My two older daughters are 8 and 11, so i am literally starting over and am in need of everything. I love reading your blogs and the birth stories (frankly i've become addicted sitting at the computer for hours reading story after story.) I love to tell my husband all the interesting and often funny stories i've come across. I would love to win a Moby for our baby that is due in a month! Nothing like wearing those sweet babies! Hannah was my doula, she's great! Thanks for the opportunity, love your wraps! I love these! Such a great thing. And I agree with those before me: Your blog is amazing! Such a great resource and full of encouragement. :) Thanks for all you do! Not sure if this is still live where I can comment, but liked it! My wife uses a baby wrap and thinks they are the best transport when we're out.